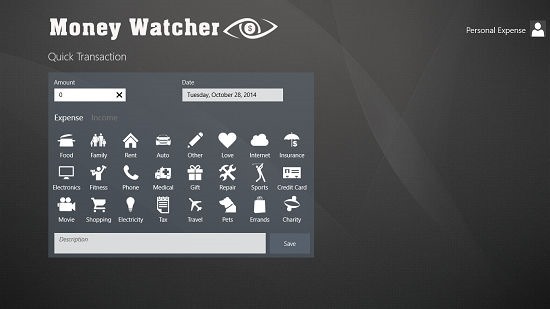 Money Watcher is a free income and expense tracker app for Windows 8 and 8.1. When you run the app on your device, you will be shown a screen wherein you will be able to add the income and the expenses as easily as typing the desired amount in the text field which will be shown on your screen, and then choosing the type of transaction (Income or expense) and finally choosing the category of the expense from the list of categories displayed on the screen. The app makes for a great transaction tracking app. Money Watcher can be grabbed for free from the App Store. When you open up the app upon its installation on your device, you will be shown the home page, aka, the landing page of the app. The attached screenshot will show you what it actually looks like. The home screen basically gives you access to toggles which allow you to input your transactions. Let’s find out how we can actually add a transaction. If you see the screenshot of the main screen, you will see a big column at the center which allows you to add transactions. In the below screenshot, you can see a close up of me trying to add an expenditure. All you have to do is to enter the transactional amount under the amount tab, set the date via the drop down menu, choose the category by merely clicking on it and pressing on the Save button. 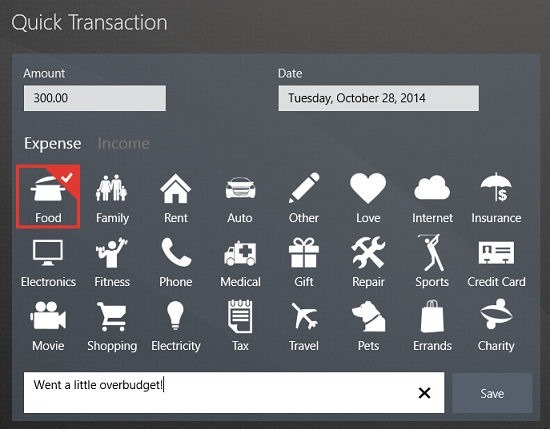 You can also change the transaction that you are adding from Expense to Income type. All you have to do is to click on the Income text label next to the white Expense text label. Once the saved button is pressed, your transaction is recorded into the app. Once you add the transactions, you will be shown a bar graph detailing you your expenses for the month, week or the day. You can also see your expenses and the expense type along with its description right next to the bar graph. In the screenshot below, you can see multiple transactions being displayed on the bar graph, and you can also see tiles of recent expenditures next to the bar graph. To add another transaction, scroll to the right and use the Quick Transaction box which you earlier used to save the transactions into the app! 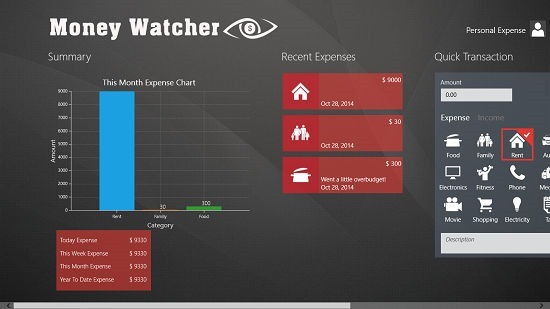 This concludes the main features of the Money Watcher app for Windows 8 and 8.1. Money Watcher is a well designed app with a nice touch that entails you to view all your transactions in a neat, detailed interface where you can also see graphs of your transactions. This might allow you to manage your transactions better, and give you a better feel of where you might be going wrong in your budget planning. The app gets the job done for me, and I have absolutely no qualms in rating it a 5 out of 5!